Borokoe Airfield is located near Borokoe parallel to the southern coast of Biak Island. To the west is Mokmer Drome and to the east is Sorido Airfield. Border Yapen Strait (Japen Strait) to the south. Also known as Borokoe Drome or Borokoe Aerodrome. Built by the Japanese as a single runway surfaced with crushed coral. A single taxiway with revetments was built off the western edge of the runway. Prior to the American landing, it appeared a second runway was being surveyed nearer to the beach. During late May 1944, captured by the U. S. Army 41st Division. 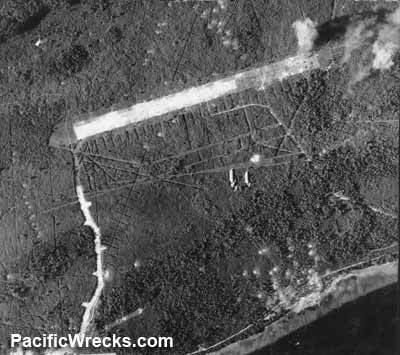 Afterwards, the runway was further developed and expanded as a air depot area to support 5th Air Force / Far East Air Force (FEAF) operations on Biak. We used the middle of the three airstrips [on Biak] I think we called it Baroke [Borokoe]. It was all coral and smooth as glass (particularly when it was wet). If I remember correctly, it had oil pots lit at night to outline the runway. When it rained most of them would go out but the while coral was very visible anyway. It was right next door to the strip that was used as a depot. I delivered a couple of A-20's to the depot for salvage in early '45. Biak was the only place I was present while live bombs were falling. 3 Bettys flew over in formation and dropped a string of daisy cutters over the ramp and past the Officers Club. I was in the club having a beer after having landed from Finschaffen and dove into a drainage trench just outside the club. The bombs didn't do any significant damage, but I scraped the heck out of my chest on the coral in the trench. There was a field hospital near the area they talk about being a nice beach. We would go up there in the afternoon with a cooler of beer and troll for nurses. Saw a lot, but never made actual contact." Borokoe Airfield continued to be used by Dutch as a military airfield operating P2V Neptunes and later Hawker Hunters until Indonesian Independence. Since 1962, disused and abandoned. "It was all abandoned: hangers, Quonset, administration buildings and a derelict Hawker Hunter! The Indonesians keep the base looking quite good with all of the weeds kept down. Surprising shape after 30 years of abandonment by the Dutch. The runway was in good shape. I walked all around the base, no one around other than some kids playing basketball."